From 10-12 October 2017, 270 scientists from all over the world came to Erlangen for the International Congress Engineering of Advanced Materials ICEAM2017. During this three day scientific event, local FAU researchers presented their work of ten years of profound research experience under the overall topic “Engineering of Advanced Materials”, and discussed their results with researchers from 17 different countries. The focus of ICEAM2017 lay on EAM research fields Nanoelectronic Materials, Photonic and Optical Materials, Catalytic Materials, and Lightweight Materials, with special emphasis at EAM’s cross-sectional topics Functional Particle Systems, Nanoanalysis and Microscopy, and Multiscale Modeling and Simulation. 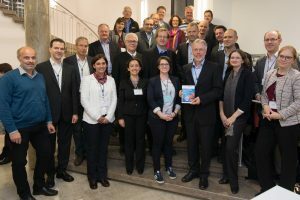 With this structure, the congress was able to picture the practiced interdisciplinary nature, which has so characteristically been built up at EAM for the past ten years, and is now a major advantage of the research in Erlangen. During the three days of ICEAM2017, the interdisciplinary exchange of views was encouraged by premium quality plenary and keynote talks, combined with a total of 80 contributed talks in 20 sessions – all taking place at the south campus of the university, where one could clearly see how much is currently invested in building best conditions for the research in “Engineering of Advanced Materials”. The congress was opened by EAM’s coordinator Prof. Wolfgang Peukert, who gave a short introduction into EAM followed by a presentation of the Research Area A1 Functional Particle Systems. Subsequent Prof. Cynthia Friend (Harvard University) gave her plenary talk on “Design of sustainable catalytic processes on nanoporous materials”. After a short coffee break the keynote lectures of Prof. Irene Beyerlein, University of California (UCSB) and Prof. Bala Subramaiam, University of Kansas preceded the start of the first sessions. The afternoon started with the plenary talk of Prof. Ole Sigmund (Technical University of Denmark) presenting “New multiscale approaches in topology optimization”. Prof. Tim Clark (FAU) gave insights into EAM Research Area A3 which was followed by the tandem FAU keynote lectures of Prof. Carolin Körner together with Prof. Hannsjörg Freund and PD Dr. Wolfgang Hieringer together with PD Dr. Marco Haumann. After a short break Dr. Advenit Makaya (European Space Agency – ESA) and Prof. Alan Aspuru-Guzik (Harvard University) continued with their keynote talks. The following four parallel sessions of the first day were completed by the EAM Talk of Prof. Peter Wasserscheid (FAU), who presented EAM Research Area D. The first day’s program was rounded off by a poster session in the Tentoria where researchers presented their latest scientific projects and got the chance to get to know each other better. Of a total of 96 posters three poster prizes were awarded. Our Congratulations to the winners: Junwei Wang (Institute of Particle Technology, FAU), Tobias Luchs (Chair of Organic Chemistry II, FAU) and Andreas Leber (Mechanical Engineering, MIT & Advanced Materials and Processes MAP, FAU)! The second day of the congress started with the plenary talk of Prof. Andreas Stein (University of Minnesota) followed by the talk of Robin Klupp Taylor (FAU), outlining EAM Research Area C. After a coffee break the day was proceeded by keynote talks of Prof. William Curtin (École polytechnique fédérale de Lausanne – EPFL), Prof. Markus Schmidt (Universität Jena), Prof. Jana Zaumseil (Universität Heidelberg) and Prof. Regina Palkovits (RWTH Aachen), followed by four more parallel sessions. After lunch Prof. Paolo Samori (Université de Strasbourg & CNRS) dedicated his plenary talk to the “power of light”, and EAM Research Area B was introduced by Prof. Andreas Hirsch (FAU). The afternoon session talks were opened by the keynote talk of Prof. Norbert Koch (HU Berlin) and the tandem talk of Prof. Michael Engel and Prof. Nicolas Vogel (both FAU). The second day was rounded off by the EAM Talk of Prof. Carolin Körner (FAU), presenting the Research Area E Lightweight Materials. As further highlight of the day the participants were invited to the congress dinner in an extraordinary location: the bright baroque hall of a former church in the heart of Erlangen. Prof. Andreas Schreyer (European Spallation Source ESS ERIC) opened the last day of the congress with his plenary talk on “new opportunities on materials science” and was followed by a presentation of EAM Research Area A2 Nanoanalysis & Microscopy by Prof. Erdmann Spiecker (FAU). After the coffee break Prof. Tanja Weil (Max-PlanckInstitut für Polymerforschung, Mainz), Prof. Helmut Cölfen (Universität Konstanz) gave insights into their respective research fields in two keynote talks. The talks were followed by a triple talk of Dr. Ning Li, Dr. Stefanie Rechberger, Prof. Tobias Unruh (all FAU) and a tandem talk of Prof. Gregor Witte (Phillipps-Universität Marburg) and Prof. Bernd Meyer (FAU) and were complemented by the last sessions of ICEAM2017 ranging from topics of Bio-interfaces to Liquid film catalysis. The concluding remarks and poster awards, presented by Prof. Wolfgang Peukert, completed a very successful congress which is not only reflected by the number of attendees but also by the high quality of presentations and discussions during the three days in Erlangen. After that, interested participants had the opportunity to visit the laboratories and research buildings of all EAM Research Areas, including a tour of all newly constructed research facilities initiated by EAM. All in all, ICEAM2017 was a full success, giving a high class insight into the past ten years of regular EAM funding and its results, combined with excellent international contributions to exchange up to date research highlights. 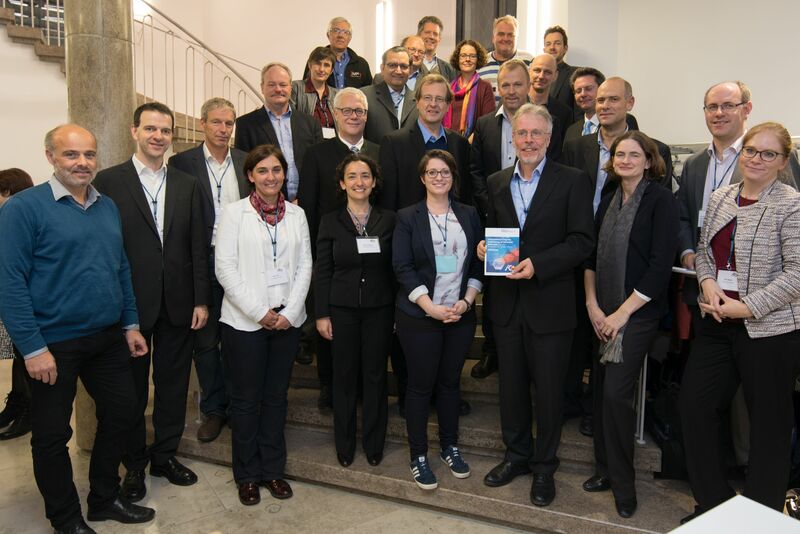 All this was made possible by an excellent Scientific Organizing Committee, the full hearted support all members of EAMs professional administration and the financial support of the Deutsche Forschungsgemeinschaft (DFG).